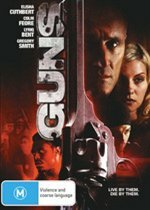 When I first saw the cover to GUNS, I thought it was a movie I may have missed but upon closer inspection, it's actually a TV mini-series that is based on the dangerous and sometimes violent world of illegal gun trading. This short series revolves around Shawn Doyle and Lyriq Bent, two agents who are following a trail to find those responsible of importing illegal guns into Toronto. Their investigation leads to a man called Colm Feore, a powerful gun lord in the criminal underworld. It may sound a tad clichéd but in actual fact, it's quite a gripping drama series. Although this interesting crime drama may not be as slick as the Hollywood movies, it's still very competent at what it does which draws together a variety of genres and leads to some interesting subplots of corruption within the government itself. Interesting enough, the series also stars Elisha Cuthbert (24) who appears to have a lead role from the cover but in actual fact plays the girlfriend of Colm Feore's son and is more of a subplot. Even so, it is quite refreshing to see her play a totally different role than in 24 or the Girl next Door. For a series made for TV, the video quality is very impressive and features a grim and gritty filter that compliments the storyline nicely. Add in 5.1 Surround Sound and when the action starts, it really helps in immersing you into this compelling story. At the end of the day, Guns is a great story that will have you glued to your screen and features some strong subplots with a central story that will leave you craving for more.